For the past few months, I’ve been on a strict no-buying hair products diet. I did it for a couple of reasons, but mainly because I was trying to pay off some trips from this past summer and I wanted to simplify my hair regimen. Really, there is no use buying 68 different conditioners because you’ll never know what is working and what isn’t. Anyhow, I did start to run out of products and some I was starting to miss not using, such as my henna! Guys, I have not henna’d my hair since this summer! I sorely need to get started doing that again. So, I bought 200g of Jamila henna – I decided to try it out instead of using the Yemeni henna that I had initially purchased. Forgive the picture -- the boxes are shiny. I ordered the henna – and a Berhempsu shampoo bar — from Henna Sooq which, sadly, isn’t located in Brampton, Ont. anymore. Sniff. Y’all don’t understand. When you find a distributor that is in the same general area as you’re in, it’s like finding the end of a rainbow: lower shipping fees and faster delivery. Now Henna Sooq is in Maryland… but Khadija is still offering excellent customer service, so I will continue purchasing from them. I’m still shedding a tear. Next up, my Essential Wholesale purchases. I’m a bit concerned about getting them here – hopefully, I’ll get a shipment confirmation this week. Hi there lovely lady! How are you? Also I am hiring a new shipping manager for Toronto, and we’re getting her to open up local pick ups in Mississauga. So I hope that works out better. She’s amazing! Also downtown Toronto will have to be re-stocked as well, as they are running low, but products will be there for sale. Lastly we are hoping Honey Fig will carry our line soon! As they have shown interest and we’re working on it. Thanks. What is your essential wholesale order? From where? It has been a long time since I had henna’ed my hair as well because of the whole summer moving and just it was something else. I hope to get to catch up with my people in Toronto when we come in. Keep well, hugs! Helloo! Hope you’re doing well in Maryland! I would love to check out the show — but that weekend is already booked up! Getting close to the holidays and we are quite the social family 🙂 I will definitely share with my Toronto readers that they will soon be able to pick up their Henna Sooq goodies in Mississauga. I will be getting my goodies downtown or at Honey Fig! That is awesome news! I ordered a bunch of products from Essential Wholesale out of Oregon. They create a number of organic products and bases including lotions, creams, shampoos and conditioners. I’m really trying to become more organic in my hair and beauty products, so I decided to try them out. The only hiccup is that Health Canada is quite stringent about certain things coming into the country, so I had to fill out all sorts of forms and being an international client had its own headaches. Oh well — hopefully, everything gets across the border. Check out their site at http://www.essentialwholesale.com. Thanks for dropping by! 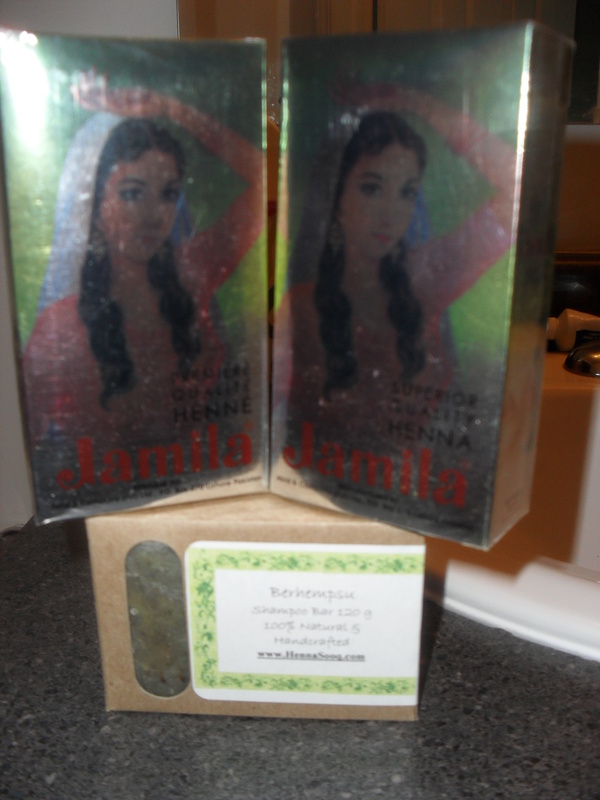 I will be reviewing the Jamila henna as soon as I have a chance to use it — probably the first week of December. Take care! Oh, and yes, yes, yes! Link us on your blog! Okay will do. Thanks so much! I’ll check out that company for sure. I even try to send items to Canada from here and it’s considered international. Even though with Canada Post to the USA when I was there, it was not considered international and they had pretty great rates compared to international charges. It’s just a headache to send from here because I’d hate to charge so much for shipping. PS Can I link your post on our blog?